So, progress was good these weeks. I resumed work with AM2R, finishing the camera controls the last rooms. I also started revamping the first area, the landing site. Remaking it after all this time made it look and play much better. Once I finish with the new tileset, I´ll put some pics up. Some scripts were updated too, now lava is drawn using a series of background elements, instead of animated sprites. I synchronized Confrontation with this change (AM2R and Confrontation are two separate projects now, to avoid having unnecesary resources in both projects), so those who experienced slowdowns in big lava rooms, specially the Crocomire and Kraid fights, will have a better framerate. Right now I´m adding Achievements to the game. The easy part is to make a nice menu to display your unlocked "Medals", the most complicated part is having the game to recognize when you meet the criteria for each one. Most Medals are common to AM2R and Confrontation, so expect to see this feature in the next update. Anyway. This year wasn´t as productive as I thought it would be. And that goes for this project and a lot of personal stuff. I won´t bother you with the details, but the thing is, I´m looking for work. My studio isn´t doing so well lately, and I happen to have more free time than I´d like to have. I´m offering my services as a game system designer, level designer, or any other role you might find productive for your project. You can find most of my earlier work in this Portfolio, if you need design documents for any of those projects, let me know. I struggled a lot deciding wether I should post about this or not. Eventually, things are going to change a lot in my life, and having a steady income is becoming very necesary. Thanks for reading this and for following the project. Great work, pal. Keep it up. 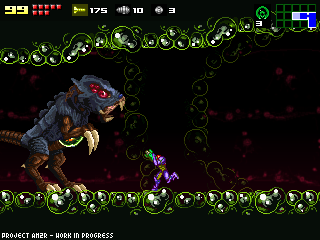 I have one question about the Queen Metroid: in the original game, you could jump in it's mouth, roll into it's stomach, and drop bombs to damage it. (No power bombs back then.) In Other M however, (SPOILER!) you use a power bomb in her stomach, which obliterates her instantly. Will you be able to do the same in AM2R? Nice to hear you are still struggling hard to make this game a piece of art. That achievement system looks pretty neat, :D cant wait to see how it works. Anyways, good luck on finding that place in the videogames industry! Hi, great to see you are still actively working on this. Good luck with finding some work man! Feel you on the job situation. Undoubtedly hard times right now. Certainly think you'll make it! Kinda wish financial troubles would vanish. I can't wait to try the full game. Gonna play it on all modes. Great idea with the backgrounds. Really want to play now. Stay strong and hang in there D64! Nothing wrong in being honest. It's financially tough times we live in for sure. I sincerely hope you get it all sorted (i'm positive you will), and once you're finished with this awesome project of yours, make sure to add a possibility to donate, as i myself (among others) will surely be willing to pay some for such a polished product. ;) Great stuff! Ooh, this makes me a happy panda! Can't wait to see the next update of Confrontation, keep it up! I know you're not allowed to charge money for fan projects like this due to liability, but once you do a full release, you really ought to think about putting up a donations button. At the very least you'll get 10 dollars (mine)! I certainly wish you the best in finding work and thank you for all the time you've donated towards Project AM2R. I look forward to experiencing your masterpeice once it's finished. Anyway, you should check out the Minecraft guys if you get a chance. Last I check, they are looking for game developers like yourself and given all the experience you have, I bet you'd fare really well. Only problem is that it's all the way in Sweden if I recall correctly. Seeing as the game is in 320x240 natively, it would be über awesome to be able to play it on a handheld such as the GP2X. Being a owner of a GP2X Wiz, imagining the possibility of being able to play this on the go (as was originally intended with the original version of the game too :P)... Oh well, it's good to dream :P.
A 30 second Haiku about Metroid. I took inspiration from the things I like about the game and where it's from (That's where I got the idea for haiku). Don't worry, DoctorM64, it happens to many of us. Me, for example, I'm looking for jobs to pay a course of airplane pilot. I wanna be a pilot, but my family just doesn't leave me alone, they want me to finish college (international relations), but I just don't see myself working on that for the rest of my life anymore. And as a pilot I'll gain a lot more money than most graduate people I know are being able to make. It was very kind of you to tell us all that, I wish luck for you and I hope you find a great job fastly. Hey man, its been awesome following you and your project for these past couple of years. Im sorry to hear about your struggles right now. Keep your head up man and continue to push on through life. Ill keep you in my prayers and wish the best from ya. Keep us posted on everything! I hope everything works out for you in your job search!! Yes, to the comment above. Please add an option to donate somewhere as I'm sure many people will feel obligated to reinburse you for your time and immensely polished hard work!!! I personaly will give $59.99 like a game I would purchase at the store. I wish you luck on the job hunt, first off. Second, I'm hoping that typo on promise was intentional, for whatever reason. Third, on the medals. Put in a few really tough ones, I implore you. Something players will actually have to work hard to earn. Maybe one for a speedrun, maybe min/max completion runs, maybe for unusual boss strategies (plain bombs only, uncharged shots only, speedboost only?). Whatever they are, I'd like a sense of accomplishment for actually achieving them. I just downloaded confrontation and i was blow away! You some incredible talents dude and I just wanted to say that I love your work. It was slick and played really well. The little touches like hanging and going into a powerball when your going into a small space, it really makes the game so much slicker and easier to play. Tbh this is the kinda game i would gladly buy because its perfect for metroid fans like me that are looking for new things to play. So heres a high five (yeah!) and keep up the good work! Haven't gone into the whole job world yet, since I'm still in school, but now that I look at it, being successfull on my dream of being a keyboardist seems quite hard... Anyways, you should at least have a donate button, never in my life have I seen such good game maker games or fan games. Your in my list of Top 10 people I want to meet! I have to say, like so many other people have, that this is one of the slickest pieces of one-man-designed software I've ever seen, right up there with the likes of cave story and (I think) La Mulana. While I can't offer anykind of materialistic help, I offer my condolences. I hope you will continue what you're doing. Especially the achievements. Keep it up Doc. You did NOT disappoint me with Confrontation. I can't make any promises, but I've passed your portfolio onto my superiors. You certainly show a wide range of design talent in a project like this, talent that I believe could take you much further in the professional world if you hone it correctly. So far, it's proven to be one of the most competently designed fan games I've ever seen, and I've been following the amateur scene for 12 years. Not getting too specific here, nor will I even reveal an identity (it's not as exciting as people reading this blog might hope) but we'll see what happens. Even if 'we' don't contact you, I encourage you to aggressively contact other developers and see if there's any such position they may have for you. Good luck finding work out there--times are tough, indeed. A bit of advice: put a little more work into selling yourself via your online portfolio. It looks a little lacking as it is now. AM2R is now award winning, and you're already a god among men in the eyes of countless Metroid fans and indie game developers. Make sure your portfolio reflects that! if you're interested, i do have a project for you. i have no money to give, so if that's a problem, no need to read on. i wrote a guide about using action replay to hack your town in the gamecube version of Animal Crossing. problem is, the guide works, but it's confusing to people without some experience using action replay. what i would want, is a program that simplifies it. sort of like Animal Map for the DS version, and AC Toolkit for the wii version, but uses action replay codes. i could do the specific and even general graphics, and i have all other resources, but i don't know any programing language at all. my name is linked to my youtube account, so if you're interested, go there and let me know. Hey, I know life is hard, and the To-Do list is always full, but I think you could take 15mins out of your day to post more often. This blog is staring to get boring, since we only get one post per every 3 months on average. I'm just sayin. That is at least 5 updates in the last 3 months. I'd like more updates too, but let's not take what we do get for granted. It's one post every three weeks or so.. stop complaining, it's not your time or effort... DocM64 says himself that he's working on getting the project finished as fast as he can, and if that means that posts are kept to a minimum to give him just a few more minutes of time for the project or for his personal life, then so be it.. it is his project.. you should just be happy that he's willing to share the finished product with everyone. All three links are down for Confrontation 2.15. Some nonsense about violating terms of service. Any chance anyone could point me to a mirror for the file? Errr... All the links to download it say it's not available due to copyright issues. Is this still available to download or am I doin' it wrong? Looks awesome, though. Hope I get to play it! Just be happy he posts anything at all. He's giving you guys an amazing game FOR FREE!!!! I think that allows him to post whenever he wants. I'd be happy if he didn't post anything else until it was finished. Patience is a virtue. Muy bueno lo q estas haciendo, me encanta el confrontation, y estoy ansioso por ver el remake terminado, ojala te vaya bien en el laburo y puedas terminar con esto para los fans de metroid,de nuevo, GENIAL lo q estas haciendo XD..
Un abrazo y a no aflojar ! Worry not pal, we patiently follow along. Are you in your 30's? I am and my situation is similar. Back on topic: you have done a great job and I patiently await for updates. Yo aporto a juan y sigue con tu proyecto y nada de apuros y que consigas un trabajo :) saludos!